East meets West in this popular classic dish. 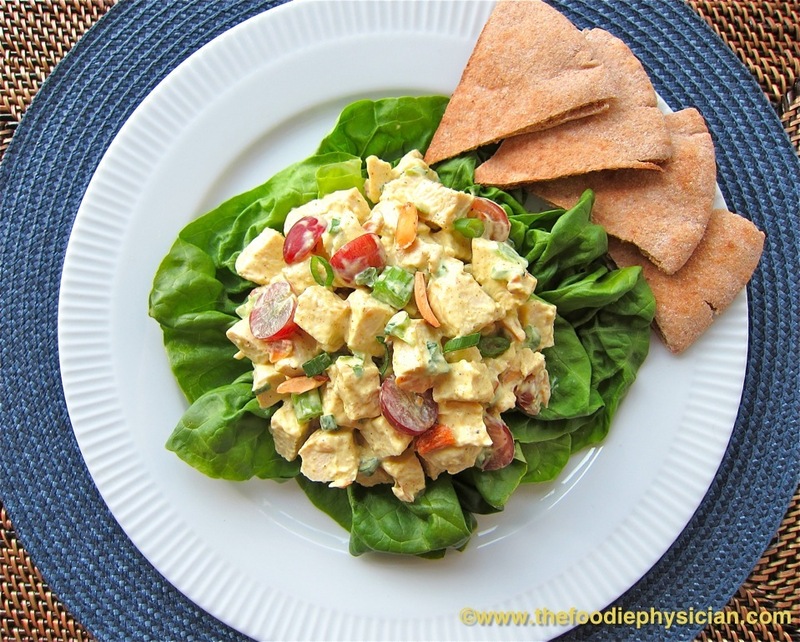 My curried chicken salad is infused with a mixture of savory and sweet flavors and plenty of ingredients to add color and crunch. Traditional curried chicken salad features chicken along with a variety of other ingredients coated in a heavy mayonnaise-based dressing. To cut down on the calories and fat, I make my dressing with mostly nonfat Greek yogurt and a small amount of reduced fat mayonnaise. Greek yogurt is naturally thick and creamy so it gives the dressing a nice texture. The tanginess of the yogurt works well with the savory curry powder- after all, yogurt is a natural accompaniment to Indian food. To balance out the spices in the curry powder and to add a touch of sweetness, I like to stir in some store-bought mango chutney. The amount of curry powder used can be adjusted to your taste. To add texture and color to the salad, I mix in a bunch of nutritious ingredients including red grapes, chopped celery, scallions, and heart-healthy almonds. Feel free to create your own version using whatever ingredients you have in your pantry. If you don’t have red grapes on hand, you can make this dish with chopped apple, dried cranberries or even raisins. Instead of almonds, you can try cashews, pecans or walnuts. This dish is perfect for using up leftover cooked chicken breast from a previous dinner or store-bought Rotisserie chicken. Otherwise you can easily poach the chicken breast needed for this recipe. Poaching is a low-calorie cooking method in which the chicken (or other food) is gently simmered in liquid until it is cooked through. Aromatics, such as fresh herbs, and an acid, such as white wine, are commonly added to the liquid to infuse the food with flavor. When poaching, it is important not to let the liquid come to a boil, but rather to keep it at a gentle simmer to prevent the meat from drying out. Poaching is a great way to cook chicken breasts to use in a variety of dishes such as salads, soups, sandwiches and casseroles. I like to serve my curried chicken salad on a bed of crunchy butter lettuce with toasted pita wedges on the side. They also make great tea sandwiches served on mini croissants or bread, perfect for showers and other parties. Mix the yogurt, mayonnaise, curry powder, chutney, and lemon juice together in a large bowl. Season the mixture with salt and black pepper. Stir in the chicken, grapes, scallions, almonds and celery. Serve on a bed of lettuce. 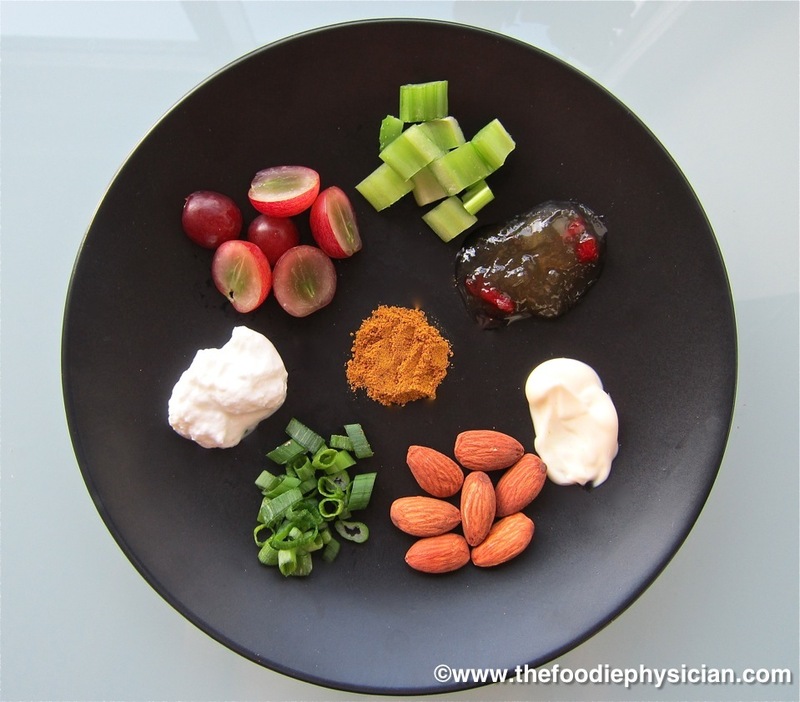 I *love* this kind of flavor combo–the curry with the grapes and almonds…yum. Thanks, Angela! I love combining savory and sweet flavors. Could I do it without the mayo? I am mayo phobic. Maybe if I used full fat yogurt it would work. Thanks for the chicken poaching recipe, so many ways to use poached chicken! Yes, definitely! I included a small amount of mayo in the recipe in case people want to have a little bit of the classic mayonnaise taste that you usually get with curried chicken salad. If you don't like it, you can use all yogurt- reduced fat would probably work well. I found the chicken poaching recipe very informative and helpful. 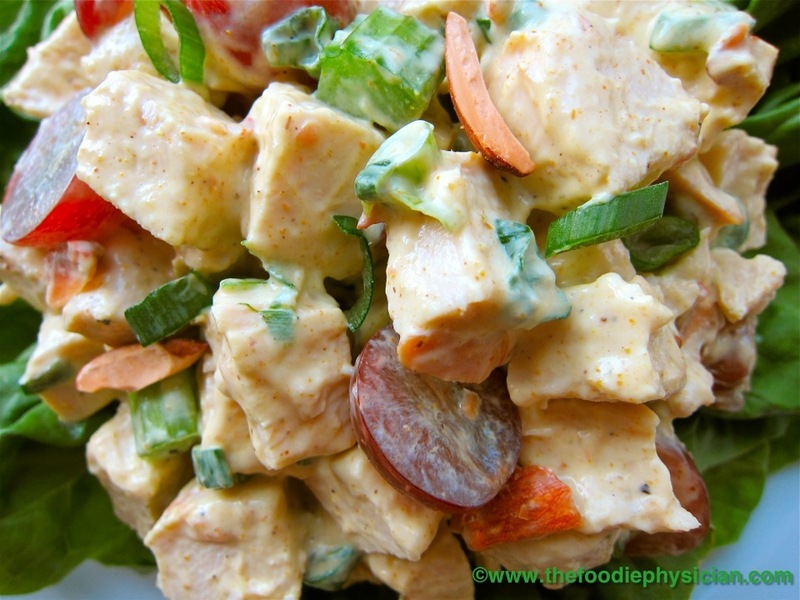 What a healthy and tasty way of eating chicken salad, a mixture of spice and sweet. yummy. Thank you! I usually make a large batch when I'm poaching chicken because it's great to have cooked chicken in the fridge for snacks, salads and sandwiches. Perfect salad and I love how that green leaf just POPS off the page! Thanks, Averie! I also love the vibrant colors in this dish.